The advertising business Peter J. Fuchs “DIRECT MARKETING” has been an integral part of the Viennese arts and cultural scene since 1996. As experienced specialists in various fields of direct marketing, we provide extensive, comprehensive, customized, and specific target audience advertising for art and culture events in the Vienna area. a. Specific target audience displaying of advertising material in cafés, restaurants and pubs, theatres, galleries, art and cultural institutions, clubs, shops, universities. Increased presence, flexibility, and actuality. We offer: regular routes throughout central districts, permanent visibility at relevant „hot spots“, maintenance (in some cases even daily), and specialized routes, which are created individually, according to the wishes and working needs of our clients. Thus, we cover around 1,200 locations in Vienna. On request, we can also work throughout the whole of Austria. 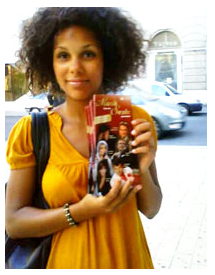 b. Hand-to-hand distribution at various cultural events – during, before, and after. For example: Film and theatre premieres, openings, previews, concerts, festivals, etc. Indoor distribution of art, cultural, and product posters. Indoor wall displaying of art, culture, information, and product posters at women’s and men’s toilets. The exit points can be found in bars, cafes, coffee houses, theatres, and cinemas. The specific target audience is located in the inner city districts according to the needs and wishes of our customers. 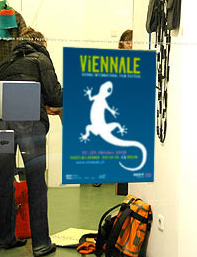 ARTscreen, the digitalized poster in low-tech format is used by Peter J. Fuchs “DIRECT MARKETING” for the specific advertising of art and culture. ARTscreens are installed in trendy bars, cafes, coffee houses, theatres, art and cultural institutions, specifically chosen stores and book shops, and at special events. The combination of low-tech art and cultural advertising presented in a slim and unassuming format fits perfectly in the city and adds a new facet to the Viennese coffee house tradition. A colourful eye catcher in grey urban surroundings! It’s 100% washable and can be displayed in unusual places as well as lit up in bright colours! After many years of experience, we have achieved a vast knowledge of the „scene“ and competence in the fields of art and cultural event advertising. We are happy to work on ad, marketing, and communication concepts in personalized partnerships with our customers. Unusual ideas, innovative advertising, and a constant exchange of information, both nationally and internationally, guarantee new and innovative ideas. Comprehensive and personal consultations are the basis for our customer care. Sabine Potuschak aka „sapotage“ is a graphic designer, illustrator and textile designer in Vienna.